The IT Centre provides access to a broadband-enabled compact training suite for company workshops and seminars as well as staff or volunteer training for businesses and community organisations. 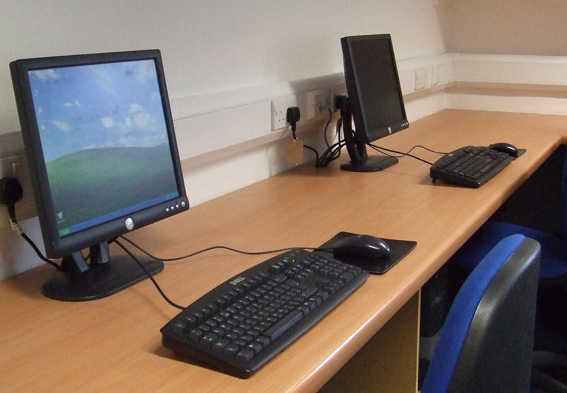 The Centre’s PCs and laptops run Windows 10 and have common programmes like Microsoft Office 2016, Photoshop Elements 15 and Skype installed, up-to-date and ready to use. We also have a range of tablets including iPads and Android devices. The training suite also has a new flat screen TV which can be used for training. The suite and our devices are available to individuals, organisations and businesses and bookings can be made on an hourly, half day or daily basis. If a bigger room with access to the Internet is required, rooms in the Community Centre can be booked and access to our wireless network arranged.